During a noontime doctors conference held at Blodgett Hospital in Grand Rapids Dr. Burkitt provided convincing evidence that the rich Western diet was the underlying cause of almost all of the chronic illnesses I was learning about during my medical school training at Michigan State University. On a cold Michigan winter day in 1971, Dr. Denis Burkitt changed my life and my medical career. During a noontime doctors conference held at Blodgett Hospital in Grand Rapids he provided convincing evidence that the rich Western diet was the underlying cause of almost all of the chronic illnesses I was learning about during my medical school training at Michigan State University. As an impressionable senior medical student, I listened to him describe observations he had made as a surgeon in Uganda. “In Africa, treating people who live largely off the land on vegetables they grow, I hardly ever saw cases of many of the most common diseases in the United States and England, including coronary heart disease, adult-onset diabetes, varicose veins, obesity, diverticulitis, appendicitis, gallstones, dental cavities, hemorrhoids, hiatus hernias, and constipation. In 20 years of surgery in Africa, I had to remove exactly one gallstone.” While serving as head of the governmental health services of Uganda, he witnessed more than 10 million people flourish on grains and tubers, eating almost no meats, dairy products, or processed foods. The purpose of Dr. Burkitt’s trip to western Michigan in 1971 was to visit Kellogg’s, the cereal company, in Battle Creek. Adding more dietary fiber to the American diet was his goal. However, his greatest accomplishment was to transform my thinking. That afternoon I remember announcing to my soon-to-be wife, Mary, “We are no longer eating white bread! It has no fiber. We are eating only whole grains from now on.” It was a start for us, even though I had apparently missed the part in his lecture about reducing meat, milk, and fried foods; and about adding much more starch to our diet. The reason for this oversight was likely because a “vegetarian diet” was a foreign concept for me; plus I could not see beyond my own dinner plate. Dietary fiber is indigestible carbohydrate that is only present in plants. 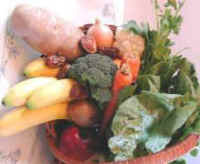 Although Dr. Burkitt was referred to as “The Fiber Man,” he fully understood (as you can see in the interview) the broader concept that the proper diet for people is based on unrefined starches, along with green and yellow vegetables, fruits, and severely limited amounts of meat and dairy products. Prior to hearing Dr. Burkitt’s revolutionary ideas, I believed that the common chronic diseases I was learning about were all unsolvable mysteries, perhaps due to viral infections or genetic mishaps. After his presentation, I realized, for the first time, that being a doctor might mean more than treating the signs and symptoms of my suffering patients with pills and surgeries. Common diseases could be prevented, possibly cured, by eating simple, inexpensive foods. However, I did not fully understand the practical implications of his lessons until I had made similar firsthand observations as a sugar plantation doctor on the Big Island of Hawaii between 1973 and 1976. Dr. Burkitt was able to change the course of medical thinking twice in his career by observing, and then reporting on, the people he cared for in rural Africa. First he discovered that one of the most common cancers in African children was due to a viral infection (Epstein-Barr virus). In recognition of his finding, this fatal condition became known as Burkitt’s lymphoma. Effective chemotherapies followed his discovery. His second major contribution came after observing that diseases widespread in Western countries are absent in the Third World. On the basis of his convictions, he launched a worldwide crusade to change the diet in developed countries by recommending that Westerners mimic the food habits of his rural African patients. He wrote an internationally best-selling book, Don't Forget Fibre in Your Diet to Help Avoid Many of Our Commonest Diseases (1979). An enormous body of scientific research has validated Dr. Burkitt’s ideas, and the list of dietary diseases has expanded to include strokes, hypertension, osteoporosis, breast and prostate cancers, and autoimmune diseases, such as rheumatoid arthritis, lupus, and multiple sclerosis. The world, and I, owes much to this pioneer. The health of a country's people could be determined by the size of their stools and whether they floated or sank, not by their technology. The frying pan you should give to your enemy. Food should not be prepared in fat. Our bodies are adapted to a stoneage diet of roots and vegetables. Western doctors are like poor plumbers. They treat a splashing tub by cleaning up the water. These plumbers are extremely apt at drying up the water, constantly inventing new, expensive, and refined methods of drying up water. Somebody should teach them how to close the tap.